When planning an Indonesia holiday, you have quite a few choices, but there is nothing quite like Raja Ampat. If you love beautiful beaches, turquoise water, white sand, great food, and some of the friendliest people you will ever meet, this is the spot for you. What’s not to love about that? 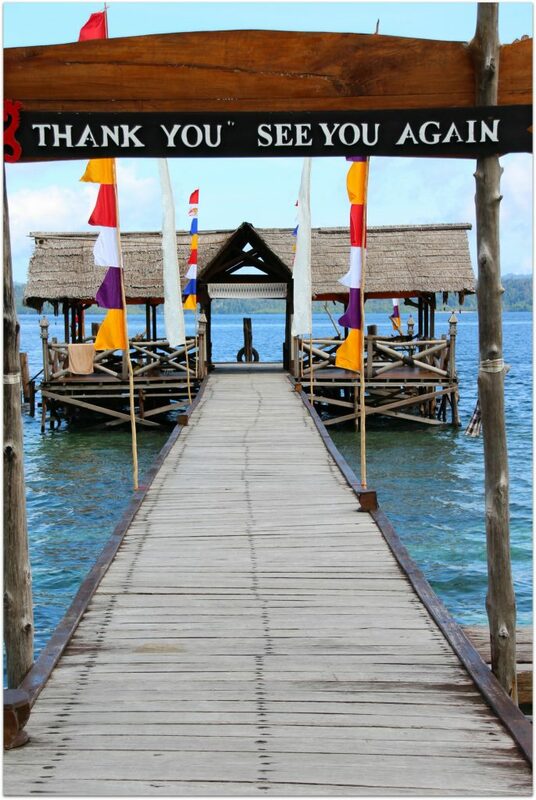 One of the destinations we were able to visit while in Indonesia was the Raja Ampat Dive Resort. I’m not a diver, but I do love to snorkel, so don’t feel you need to dive to be able to enjoy it. 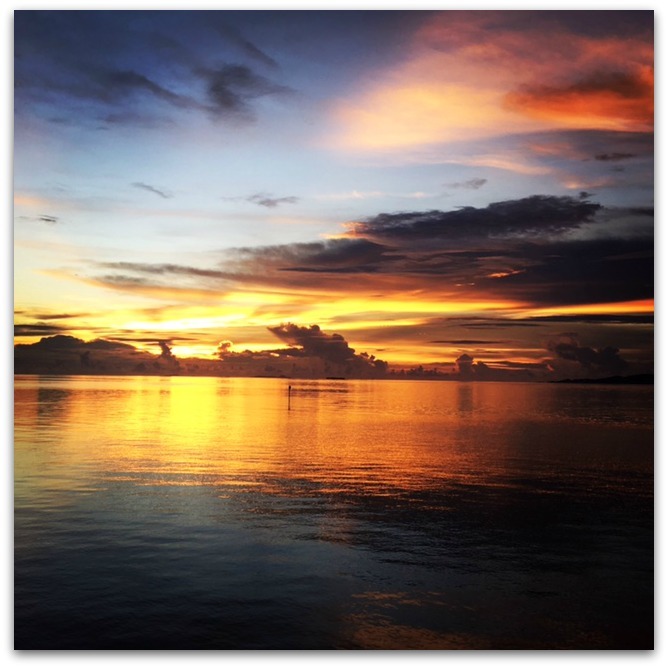 If you are from the US, Raja Ampat is a bit of a journey, but well worth it. 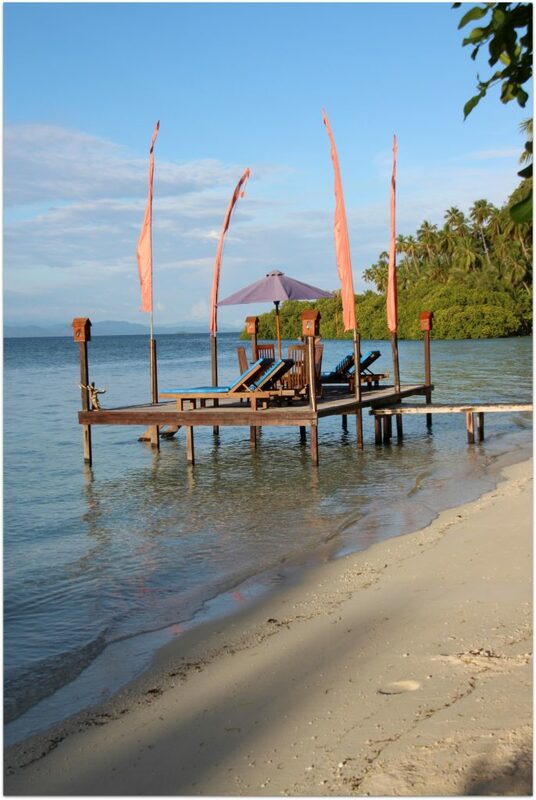 Once in Indonesia, you will need to get to Waisai harbor, and you’ll be just 15 minutes from the resort by boat. To be in such a remote location, I was prepared for the accommodations to be adequate but was shocked at how charming the resort was. The villas line a wooden path and are all facing the ocean. 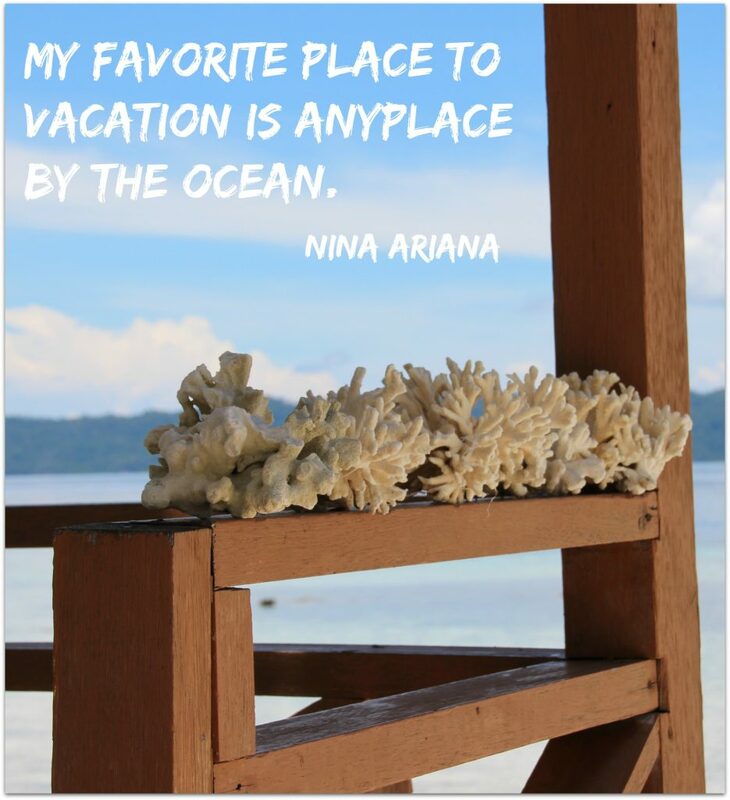 If your dream is an Indonesia holiday stay right on the beautiful turquoise waters, this will be your happy place. 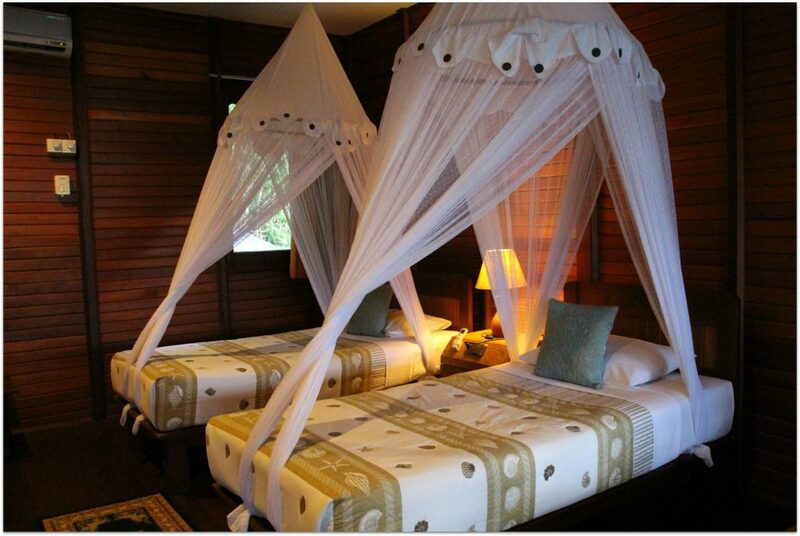 Each of the ten double villas sleeps two, with twin beds that can easily be pushed together for a romantic getaway. Bringing the kids? There’s also plenty of room to add a bed if you’re planning a family vacation. Two family villas are also available if you need a little more room. 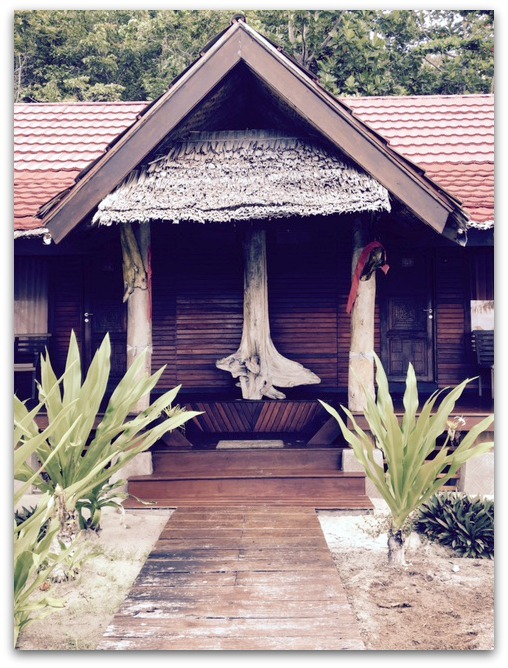 Each villa has a private bathroom with shower, air conditioning, toiletries, a ceiling fan, and drinkable water. The lovely and spacious front porch is also just 30 feet from the gorgeous beach, and lounge chairs await at the water’s edge. We really are talking about a bucket list Indonesia holiday. There aren’t many places like this in the world. 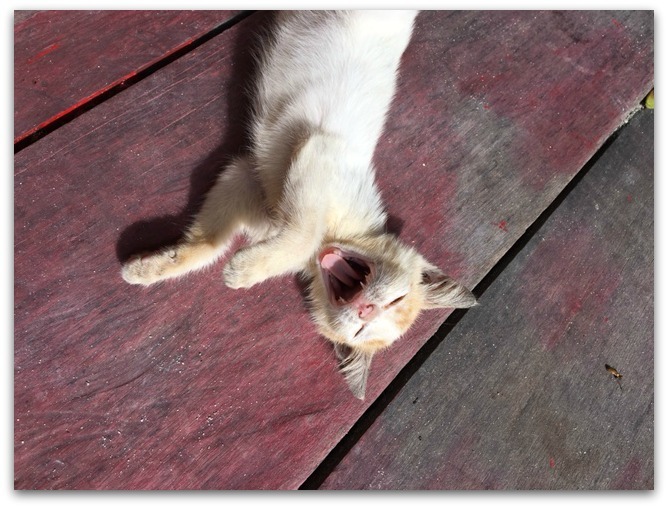 Don’t worry, being able to relax and take it easy is part of the vibe in Raja Ampat. 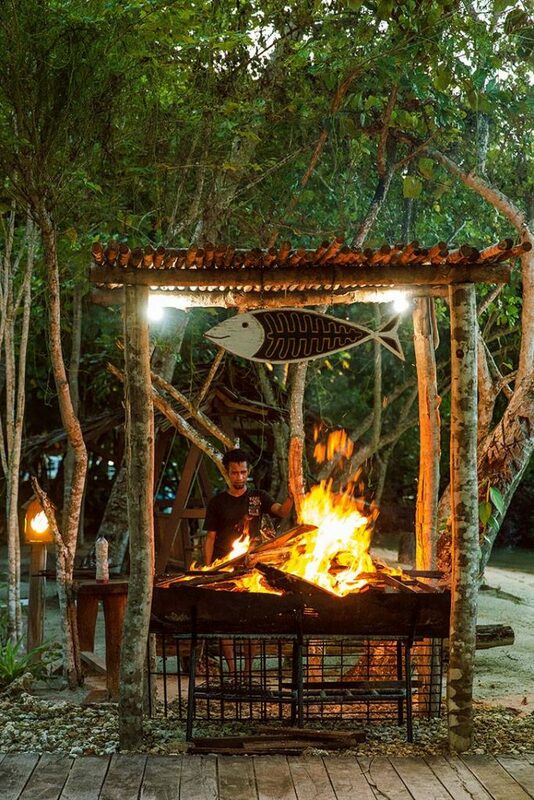 If you’re wondering about where to eat when staying at the Raja Ampat Dive Lodge, let me help you check another worry off your list. Three meals are included with your room. There’s a lovely open-air restaurant on property, just steps from your room. 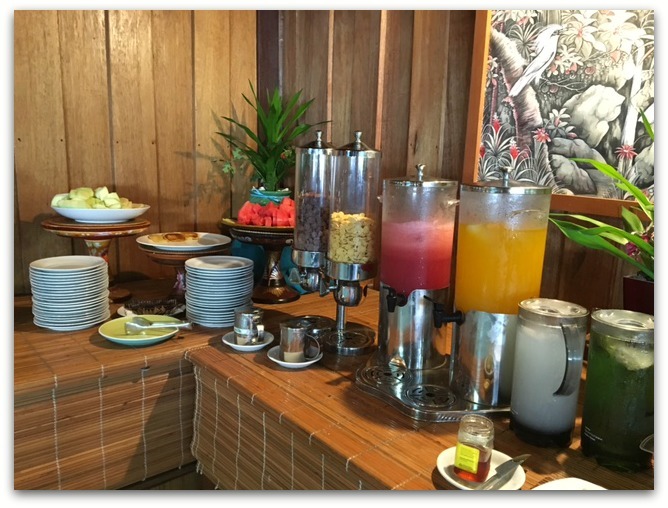 Breakfast was a variety of local and western foods. My favorite part was the fresh watermelon juice. It was so refreshing I considered giving up coffee while there! Fortunately, coffee and tea are also served, so no one had to encounter me in the morning without caffeine! I don’t think milk is typically placed on the table, but they put it out for us. They were really great about accommodating everyone’s needs. Snacks are also served a couple of times a day. One day the kitchen made pizza, a favorite food around the world. 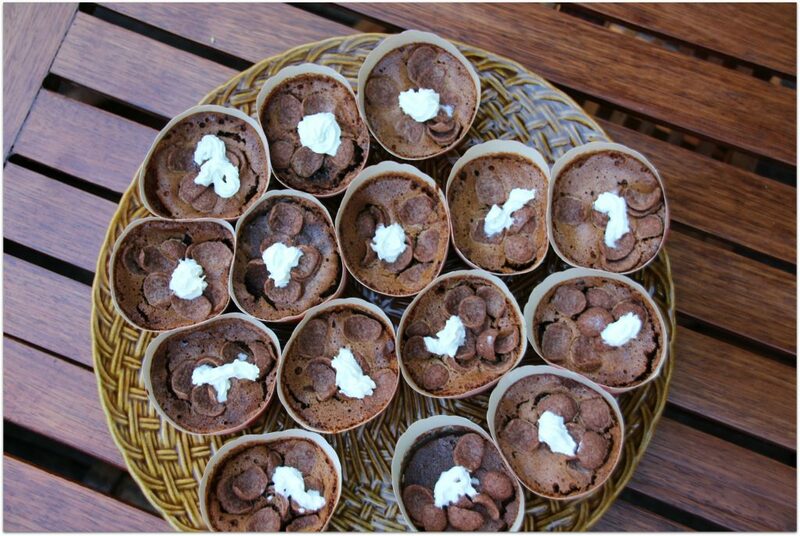 On another day, we got homemade brownie cakes. Delicious! If you’ve been a reader here for a while, it’s probably no surprise that I asked for a tour of the kitchen. I asked the chef about one of dishes he was serving, and he took me back and showed me the sauces and seafood that was being prepared for the outdoor barbecue. Once the grill was ready, he put on huge shrimp, swordfish, and chicken. So good! Though accommodations are important to me, that they were really nice was just a bonus. 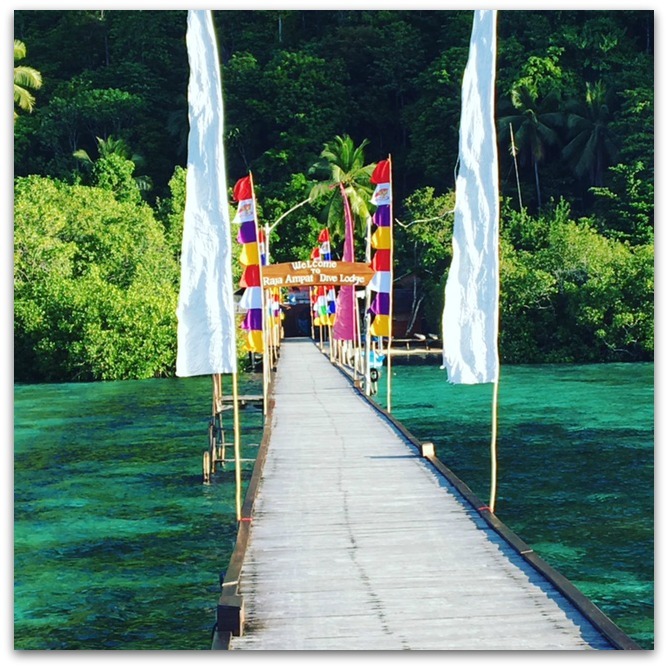 The stunning island of Raja Ampat was the real reason we were there on this Indonesia holiday. 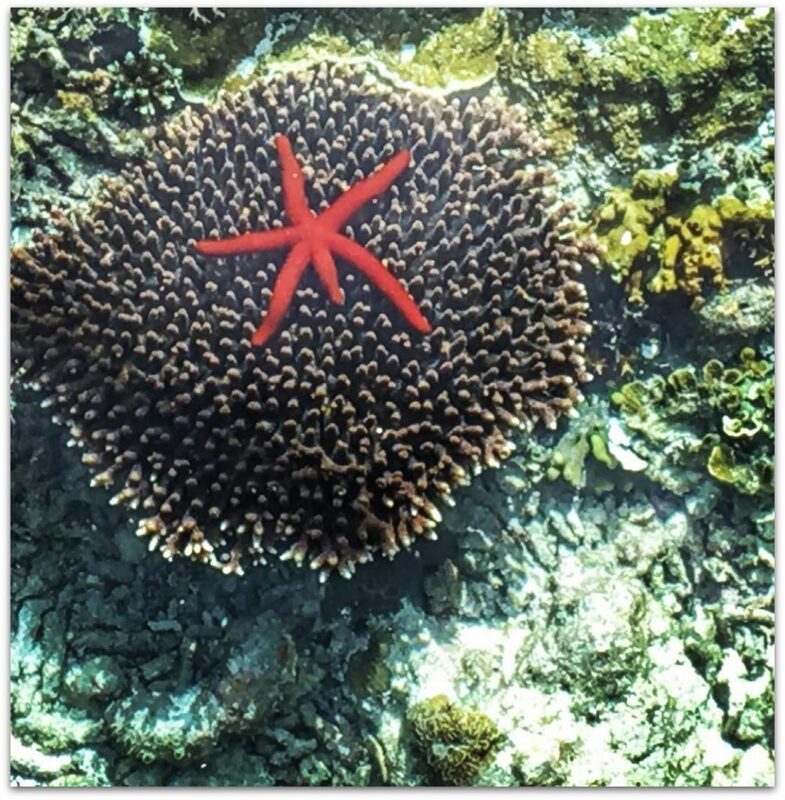 What makes snorkeling and diving in Raja Ampat special? It’s actually one of the few places on earth where you can still see most of the marine life that exists on the planet. I don’t dive (yet) but the snorkeling was insane! Right by the pier, I saw clownfish, lionfish, and a huge moray eel. I was so excited to see the eel that I popped up and yelled to everyone to look for it, but when I looked down again, it was gone. 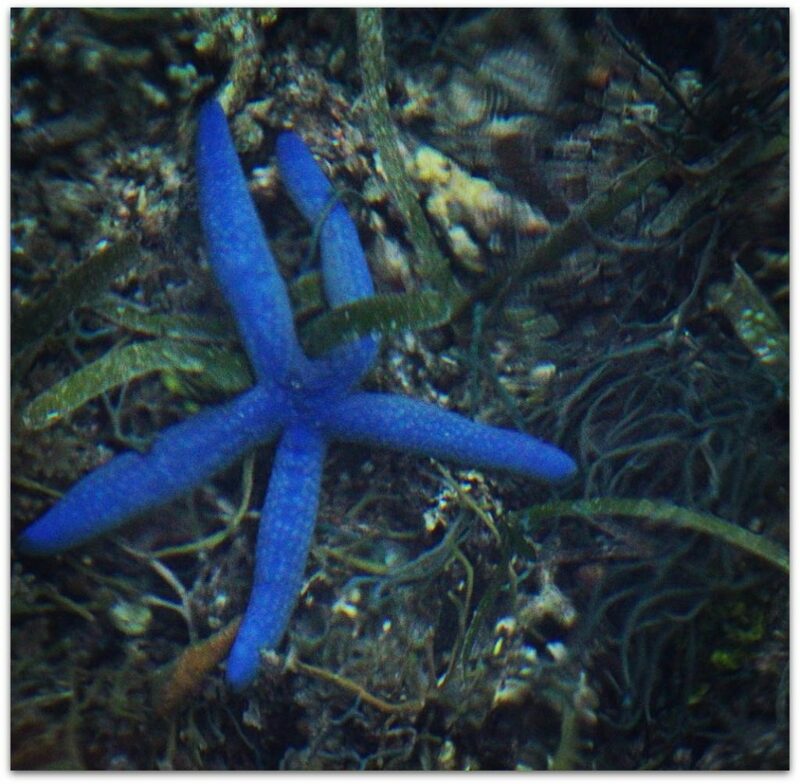 I did see a gorgeous blue starfish right from the pier. That is how clear the water was. And then I saw the red one below. Crazy, right? You never know what you might see while diving. You could see white tip, black tip and grey sharks, green turtles, oceanic as well as black and white-bellied mantas, schools of mobulas, more schools of bump-head parrot fish, huge groups of barracudas, jacks and more. Pigmy seahorses, different species of nudibranch, ghost pipefish, mandarine fish, blue-ring octopus, and harlequin shrimps have all been seen right there in the waters not far from Raja Ampat Dive Resort. One of my friends on the trip even saw a Raja Ampat carpet shark, also known as a walking shark! They actually walk on the ocean floor using their fins! So… what if you don’t dive or snorkel? Well, first of all, you really should at least attempt snorkeling in this incredible spot. You can simply walk down the steps at the end of the pier and float with the snorkel and mask. No getting on a boat to go out in the ocean. The water is calm and it will be the experience of a lifetime. But…if you absolutely don’t want to snorkel, there are a couple of places you can grab a lounge chair and just chill with a good book. Kayaks are available and you will find smaller islands to check out for great photo ops. 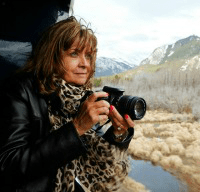 Bucket List Journey also has a list of things to do. And be prepared every night for a spectacular sunset. I can’t believe how many gorgeous photos I have of the sunset. Each minute it changed and was more breathtaking than the last. 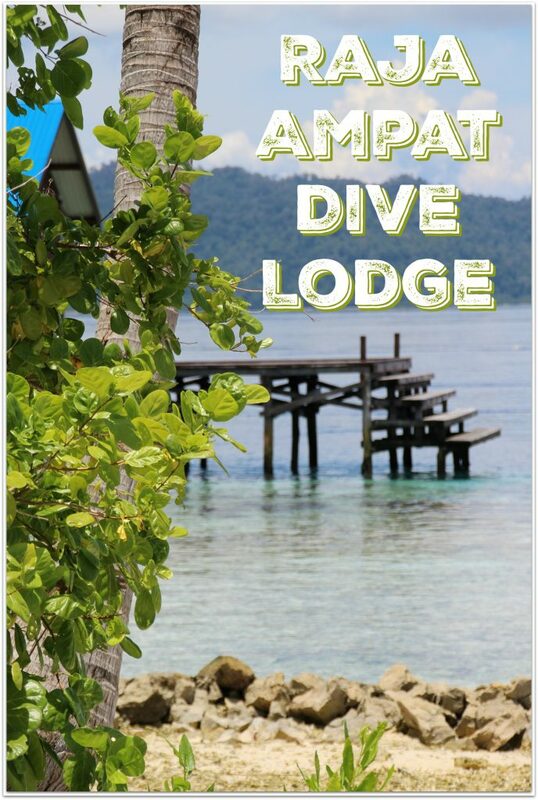 Stephanie Barros Castro is the booking manager and will help you set up your reservation as well as diving, snorkeling, kayaking, or anything else you choose to do while at Raja Ampat Dive Resort. While you’re in Indonesia, you really should try to get to Gili Trawangan if you love that island vibe. Thank you to the Ministry of Tourism for hosting me on this Trip of Wonders! To see more about what we did, check out this post where we learned some traditional games of Indonesia, and follow the hashtags #TripOfWonders and #WonderfulIndonesia. It’s true! Raja Ampat is a snorkellers heaven. Another fabulous way to experience it is by staying at one of the many family owned beach bungalow accommodation options available in the islands. Many of them have professionally staffed dive centers and all of them have excellent snorkelling at the door. 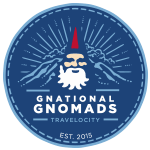 Staying at locally owned accommodation will also directly support local village economies and the international conservation effort in Raja Ampat. Thank you for sharing, Doug!